First, I want to start off with a bit of honesty: we really didn’t think we’d still be in our house by the time the Holidays rolled around. This wasn’t the plan. But as with most things in life, the Universe doesn’t always care about our plans. Part of me is very bothered by this, but for the most part, I’m just trying to roll with the punches. November is traditionally a month of gratitude and I plan to focus on that more than what didn’t happen or isn’t where we wanted it to be. As of right now, we only have one major plan: to finally take ownership of our travel trailer! We put our deposit down at the end of September, but finalizing everything and actually bringing it home had to wait a bit. We’re still sorting out what this means for us as our house still hasn’t even gotten an offer yet. Originally we’d planned to go ahead and move into the RV, knowing the house would show better 100% empty, but the thought of living in an RV in a Michigan winter isn’t thrilling. We may need to start exploring what selling the house would look like if we were out of state. Other than that, we don’t have any real plans for November. We have one extended-family birthday this month, so the kids are busily making birthday cards. And since we live away from our families, we just do a small family meal with our crew. Whether we do our normal Thanksgiving meal will depend on if we’re in the RV or still in our “sticks and bricks.” I’m also wanting to look into some Thanksgiving celebration alternatives since we’re becoming more intentional about our celebrations and what we’re passing down to our children. Since the clock is finally really ticking on our #EpicAdventure, many of my goals are revolving around that. This has meant putting certain goals on hold for the time being, and I’m okay with that. New posts here at BFM twice a week. Track every penny in and out. Find a budget system that works for us. I’m not going to lie, some of these goals feel a bit overwhelming. Particularly the one about bringing the hours spent on my “day job” back under control. I love my remote job, but it’s been far from a 9-to-5 and balanced with Josh driving for Lyft, and attempting to downsize this house, it’s meant that my own work has taken a back seat, and you know this because I haven’t been around the blog much in the last year. We learned that we have things down to art for when I’m traveling. Josh is a pro at managing the kids and getting the house ready for Open Houses without me. I’m extremely grateful for this. I am NOT a night owl–and trying to be one is majorly screwing with my status as an early bird. I am great on 6 hours of sleep, but my focus and productivity are at drastically different levels late at night versus early in the morning. We still have way too much stuff that we’re hoping to fit in our new rig and we’ll need to pare down again in a major way. The budget system we’ve used for the last year and a half isn’t really working with our new (very) variable income. I always knew that variable incomes were different to work with, but I failed to realize just how big of a change it would be. Your turn! 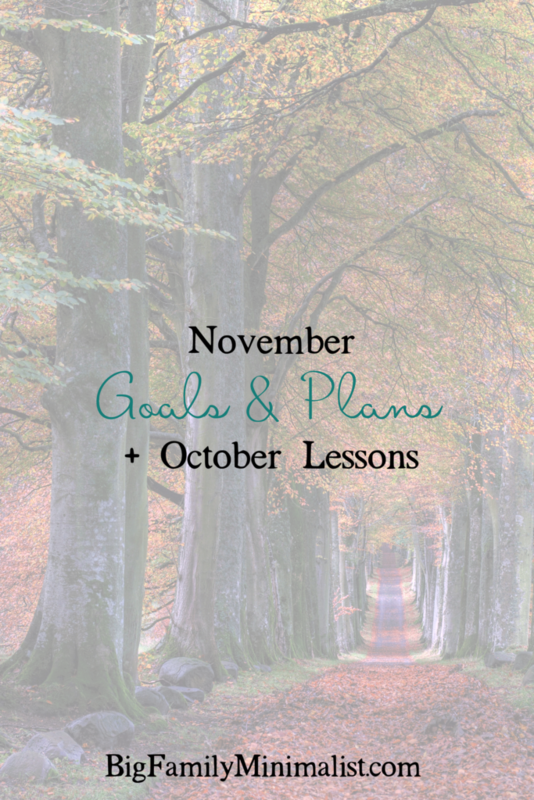 What did you learn in October and what plans do you have for November? I just found your blog shared to me via a facebook friend a long time ago. Funny thing is, that was way before I learned about fulltime rv living, way before I bought my motorhome, which has no sat for a year and a half with us unable to get on the road. I too am trying to roll with the punches and just keep being flexible. So, glad to find you again! Ah, so happy to hear you’ve found us again! Getting on the road is such a roller coaster (and it doesn’t seem to end once you’re on the road).